About two years ago, a friend of mine had profiled me for her College of Communication CO 201 class. 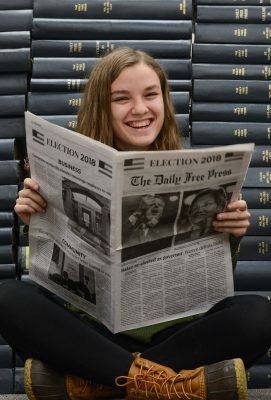 When she got around to the question, “What do you want to do in the future?” I had answered that I wanted to be the editor-in-chief of The Daily Free Press. When I came to college, I had basically no journalism experience. The first thing I joined when I arrived at Boston University was FreeP. It’s where I learned how to write journalistically, where I learned to interview, where I learned to break out of my quiet shell. It’s also where I found my forever friends. After over two years at FreeP, I wouldn’t trade any of the relationships I have made for the world. They say that once you find your people, you just know, and trust me, I know. Beyond the amazing people FreeP has, we’re extremely passionate about journalism — we are a newspaper, after all. This summer, when The Boston Globe asked journalists to stand together for a free press, we stood right next to major newspapers, local papers and even other student papers. We even made it as far as making it into The New York Times itself. Coming into this semester after making it into the Times, we had to suddenly move into a new office in less than a month when students weren’t back on campus. We started our first couple of weeks as a newspaper with two desks and four chairs. Still, we loved every moment of it. Before classes even started, a fire destroyed a dorm room on Commonwealth Avenue. Without complaint, our editors went, not even thinking about how staying up late to report on it could affect their first classes. About halfway through the semester, there were reports of a man with a gun running near campus. We went out there, reporting right in front of the Barnes and Noble where the man was rumored to be inside. Although it turned out to be only an airsoft gun, and the man was not in Barnes and Noble, we were there. And, when the Boston Red Sox won the World Series for the fourth time in this millenium, we were there, watching the city cheer and celebrate — and break some lights — for their beloved team. We were there when the city came together, as confetti flew around them, when the champions rolled down Boylston Street in duck boats. And still, we loved it. When I think about how long the nights may be here, how many hours, how much missed sleep comes with being a part of FreeP, I wouldn’t want to be surrounded by anyone else. Shaun, Vig, Diana, Lily, Isabel, Jen, Alex, Hannah and Jaya — you are the reason I love what I do here, and the reason why I’m going to miss this place and everything that comes along with it. I wouldn’t want to jam out to “Baby Shark” or “Rasputin” with a different group of people. I wouldn’t want to stay up and only run on 20 minutes of sleep with anyone else. And, most importantly, I wouldn’t want to make a paper with anyone else. Mike — we both entered this semester knowing very, very little about each other. Now, we’re heading out with you as one of my closest friends. Thank you for keeping me sane during moments when I wanted to go kick a wall (and maybe have) and thank you for being you. This semester would have been endlessly harder without you and your humor by my side. Thank you. Thinking about our little nook under Insomnia Cookies, I wouldn’t want it any other way. We’re in the middle of campus, right in the heart of everything. In a way, FreeP is the same way — right in the middle of campus life. It’s hard and pushes you to your limits, but it’s so vitally important to our school and holding those in power accountable. Still, with all of these difficulties, we love it. And, as I think about leaving FreeP editorially, the one organization I’ve stuck with since freshman year, I see how far I’ve grown since telling my friend I wanted to be editor-in-chief one day. I see how far I’ve grown journalistically. I hope to have inspired someone, one of the FreeP staff, to think the same way, to dream the same way. Because if they’re anything like me, they’ll love it. And they’ll see that all of the hard work, long nights and too many Insomnia Cookies is worth it. To everyone who is still discovering what they want to do, join the FreeP. You won’t regret it. And if you already have, welcome to our family.